Clinton Knox, founder and CEO of local tech startup Brainitz pitches his educational program at the University of Colorado at Colorado Springs Lion's Den Pitch Competition on April 19, 2017. Knox took first place and won $1000. Students can be many types of learners - even online learners. 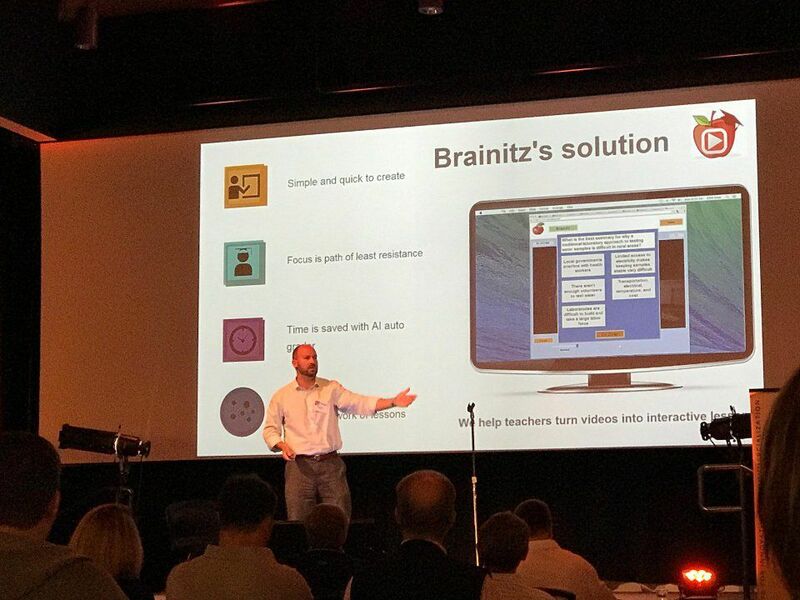 Colorado Springs-based tech startup Brainitz developed a software tool for teachers to create and upload lectures online and add questions that pop up throughout the videos for students to answer. "When you can take modern technology and allow teachers to personalize it for their students, I think you have something special," said Clint Knox, founder and CEO of Brainitz. Knox is a ninth-grade English teacher at a local public high school and going into his 10th year of teaching. About two years ago, when many students fell behind in class, Knox said, he wanted to develop a program to help them catch up on their work. "I wanted to give kids the opportunity to have control over their education and learn at their own pace where and when they're ready," he said. Teachers pre-record and upload videos of themselves, and can assign their students to watch them during class, if they're absent or even as homework. Brainitz is compatable on laptops, tablets and within the upcoming school year, cellphones. "What started as a way to get students falling behind to catch up snowballed into something good for all kids, whether they were struggling, advanced, or anywhere in between," Knox said. "It's turned out to be a very effective instructional tool in or out of the classroom." To mirror the learning experience, students must answer questions correctly to continue watching the online video. "In operant behavior, reinforcers tend to enhance behavior, so we thought if the student gets the question right, they get positive feedback," said Rick Keller, lead developer of Brainitz. Keller is a retired college professor whose primary area of expertise was biological psychology and learning and behavior theory. He said flexible learning devices such as Brainitz interested him; he offered his help to Knox after the two met at an event for startups. If a student's answer is incorrect, the video rewinds to reteach the section of missed material. Students must answer the question again correctly before proceeding. "This is designed not to test students but to teach them," Knox said. "To me, it doesn't matter if it takes you twice as long to get something right, so long as you get it right." Teachers can hold their students accountable for the online lessons because Brainitz keeps track of who watched the videos. Educators also can see the most commonly missed true-or-false and multiple choice questions. The platform saves teachers time because they don't have to repeat lectures or reinstruct students who were absent, he said. "It frees up teachers to work with students one on one, set up and implement more group projects and labs, and grade papers as needed," Knox said. Last year, Knox put Brainitz to the test in his own classroom. "I saw a tremendous amount of success and student enjoyment with it as well," he said. Students from two classes received a pretest and posttest for one of Knox's lectures. While one class sat through a traditional lecture, the other used Brainitz. On average, both classes earned a C on the pretest. "The kids that used Brainitz had a half letter grade better growth from the pretest than the ones who did the traditional lecture," he said. Besides good grades, Knox said, students liked that they could pause the video to take notes and be redirected to the information they missed. "I started this with a hyper focus on the teacher and it turned out the students really liked the end result as well," he said. Success continued for Brainitz as Knox said it was one of five companies to win the 2017 Imaginarium's Design Challenge, a Denver Public School District competition. The startup received $10,000 plus a partnership with the district. "This offers us the opportunity to get into a very large school district and test our product," Knox said. Multiple institutions will use Brainitz this academic year, Knox said, including the Denver Public School District, Colorado Education Association's CO-Pilot online teacher training program, Doherty High School in Colorado Springs and Launch High School - a Springs charter school. Also, Raney Intermediate School in Southern California will implement the program. Teachers can access Brainitz for free, although it comes with limited access to student data such as who watches the video and what questions they missed. Prices for the entire program range from $3.99 to $7.99 per month depending on whether a district, school or teacher purchases the product. "Our vision is to market this to teachers and have the teachers become the advocates for our product," Knox said.